Thursday 30 August 2012, k.o. 8pm Preview Newcastle go into their second leg with Atromitos firmly in the driving seat after battling to a draw in the Athens heat last week. 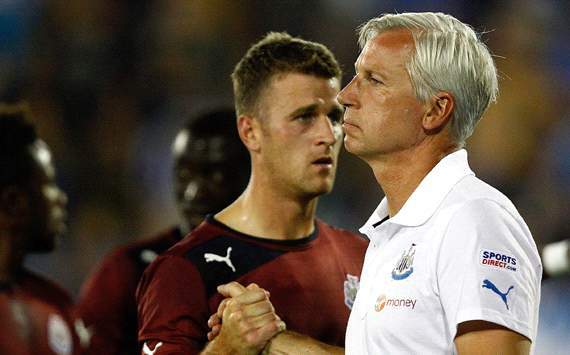 Despite having been given a scare by the Greek side when Epstein gave the hosts the lead, Pardew’s men regrouped before Ryan Taylor curled one of his trademark free kicks in on the stroke of half time. If all goes according to plan, Newcastle should find themselves in the draw for the Europa League group stage, with home advantage now being key in a deadlocked tie. However, it is of paramount importance that the team guard against complacency against a significantly weaker outfit. Naturally, a side must always be aware of losing focus when they are expected to win, but in Europe, the risk of unexpected failure could increase in comparison to the usual domestic game. For the players will recognise just how big a match this is for a club that was applying its trade in the Championship not so long ago, and in some cases, though not all, the occasion can get to a few of the players which could prove costly. I always feel it helpful if at least a proportion of the starting XI have previously adapted to the high stakes of European nights – Vurnon Anita and Davide Santon, for example. Inevitably, the possibilities of disappointment are there. The intentions weren’t to frighten any fans, but to simply remind that we’re only half way there. With the game against Aston Villa coming up, we should expect Pardew to field some fringe players and upcoming youngsters, but that shouldn’t undermine the fact that the Magpies are the better side. With the club being on the back of such a successful season, advancing to the Europa League proper would signal the club’s continuing rise in ambition and quality. All we need is the players to stick to their game plan. And with the St James’ Park faithful lifting the roof off the place, I can’t see past Newcastle’s progression to the groups.